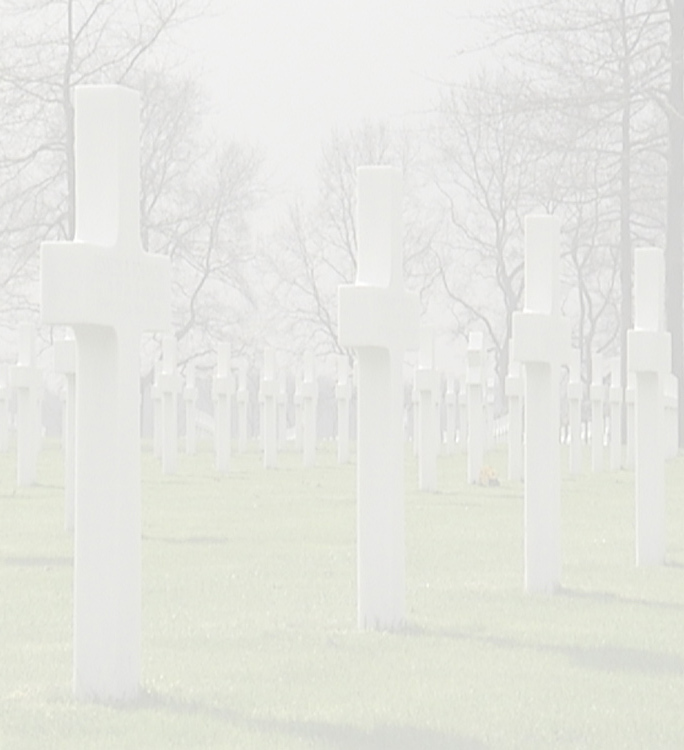 This is the story of a young WWII U.S. soldier who gave his life for our freedom. 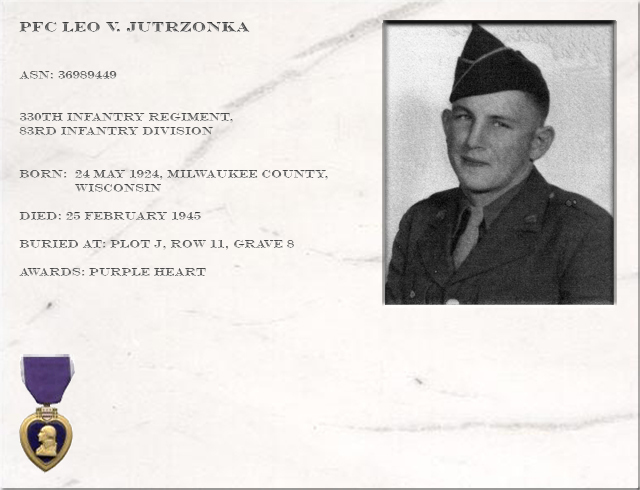 His name is Leo V. Jutrzonka who was born on 24 May 1924. 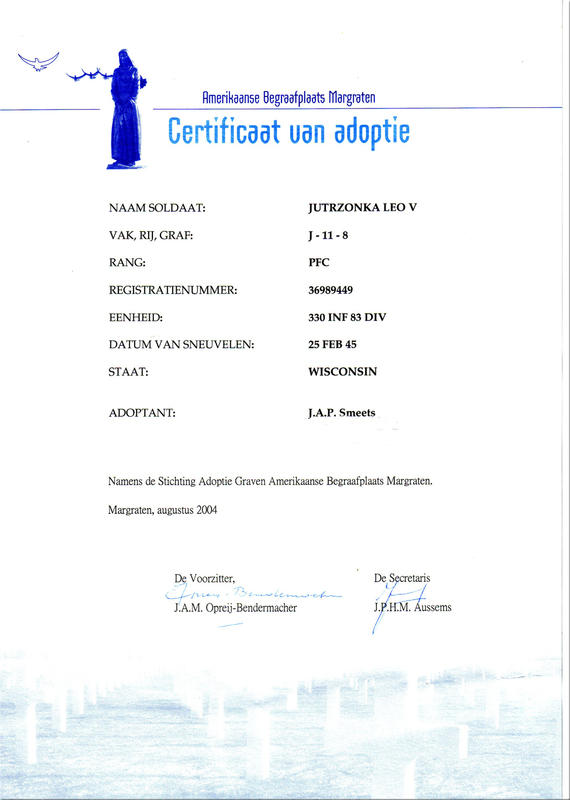 He grew up in West Allis, part of Milwaukee (Wisconsin), situated at the west bank of Lake Michigan in the North-East of the USA. He was the third youngest son of a family with 14 children ; 3 daughters and 11 sons. His father Stephen was originally from Poland and who was an interpreter but maintained a farm. He passed away at 1 February 1941. His mother was also from Poland ans she had to to raise her large family on her own after Stephen's death. Leo worked at his father´s farm before he entered the Army. The 83rd Infantry Division was first activated in the fall of 1917, several months after the United States entered World War I. It was deployed to France in 1918. On June 18, 1944, less than two weeks after the Allied D-Day invasion of western Europe, the "Thunderbolt" division landed on Omaha Beach and began advancing into France. By the end of September, the division had moved into Luxembourg. In late December 1944, the 83rd took part in the Allied effort to stop the German offensive in the Battle of the Bulge. Several months later, it crossed the Rhine and subsequently captured the German city of Halle on April 6, 1945. 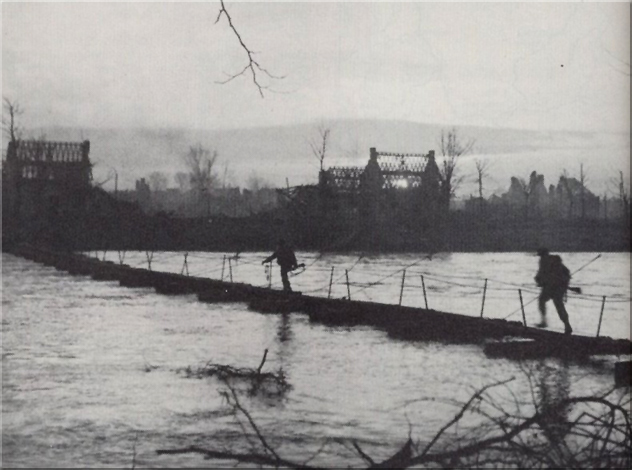 At war's end, the "Thunderbolt" division had established a bridgehead on the Elbe River. On April 11, 1945, the 83rd encountered Langenstein, a subcamp of the Buchenwald concentration camp. The camp was created in April 1944 to provide concentration camp labor for the German war effort. In its one year of existence, the camp's population greatly expanded from 214 prisoners in April 1944 to about 5,400 in March 1945. The prisoners were detailed to build underground factory installations and to carry out forced labor for Organization Todt. 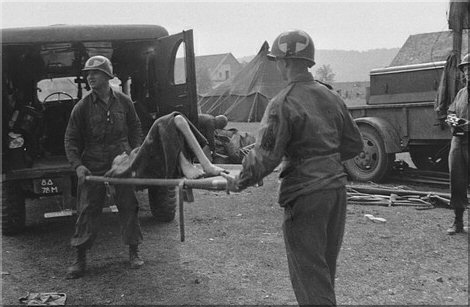 The liberation of the Langenstein camp is something most 83rd ID and 8th AD soldiers won´t forget. Pfc. 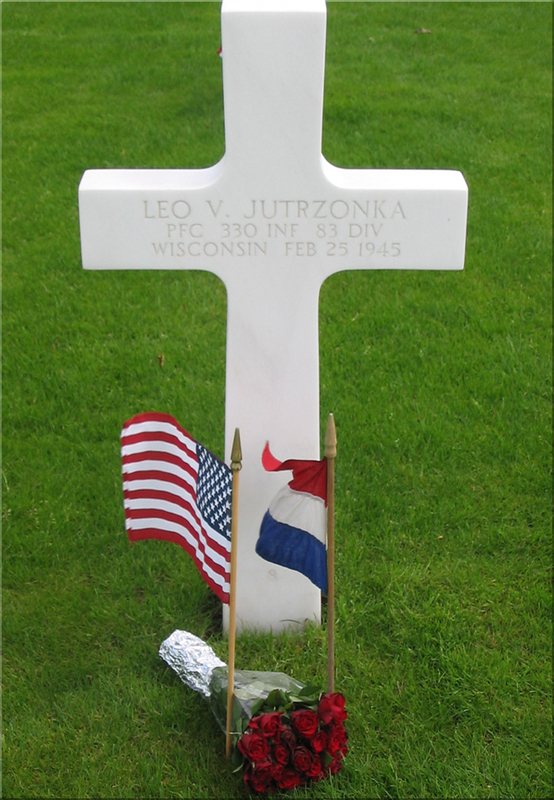 Leo Jutrzonka was killed at 25 February 1945 while his unit crossed the Roer river near the German village of Boslar, north of Jülich. The cause of death was a severly fractured left leg. Four of his brothers also served in the Army during the war in Europe as well as in the Pacific and one brother serving with the Navy. Fortunately they all survived the war. At the moment of writing this story surviving kin are sister Anna and brother Andy.